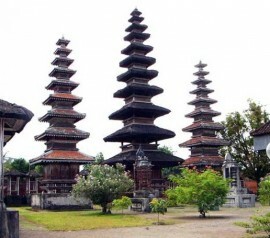 Meru temple is holding the predicate as the biggest temple in Lombok Island. The building is having quite a unique temple architecture, which is a Meru with storied roof. 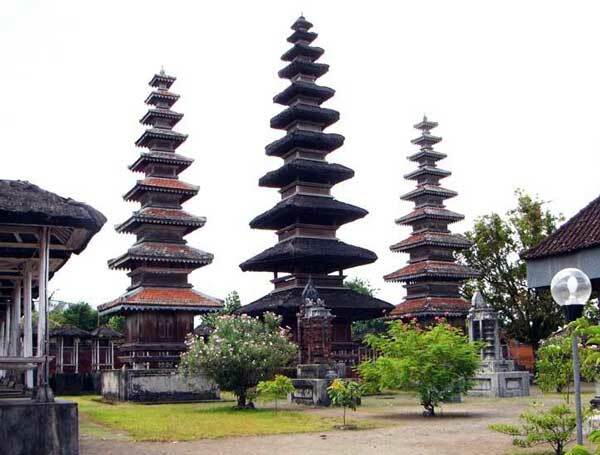 Based on the history, the temple was built in 18th century by 33 villages in Lombok. Even though most of the Lombok communities are Moslem, but you can still find some ancient Javanese-Hinduism heritages that are located in the main street of Cakranegara city, across the Mayura Park. It is very easy to recognize this Lombok temple. From the main road, you will find three meru that have leveled roof with from black straw. Meru temple is the most popular and the biggest scared place for Hindu people in Lombok Indonesia. The temple was built in 1720 by Anak Agung Made Karangasem. The place was built to unite some small palaces that were used as a negotiation place and a place to give statements to the criminals. Overtime, not only the temple be comes a sacred place for Hindu people, but also as one of the most popular attraction places. Just like the other temples, this temple is divided into three main yards (Nista Mandala, Madya Mandala and Utama Mandala) Two yards are added to support the existence of the temples. 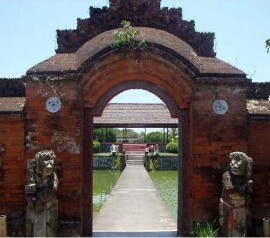 Every yard is divided by brick wall that has two wooden doors with Balinese engrave. From the three parts of the temple, the most sacred temple is Utama Mandala. This is the part where the Hindu people do their prayer. Inside, you will find 33 white sanggah. 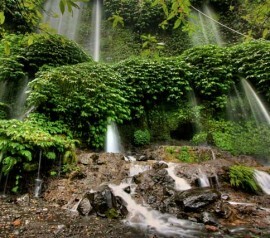 Sanggah are the symbol of 33 villages that participated to help Anak Agung Made Karangasem to build the villages. You can also find three merus rise to the sky. If you see carefully, you will find one meru has 11 stories and two meru with nine stories. The meru symbolize the major gods in Hindu religion: Brahma god (The Creator), Wisnu god (The Custodian), Siwa (The Fuser). Not only that, you can also find sekepat (a kind of gazebo with four pillars) that is usually used as Ida Pedande to lead a ceremony. In front of the sekepat, you will find sake ulu (gazebo with eight pillars) that is used as ritual offering and banten place in every religious ceremony. In the middle of Madya Mandala, you will find two stories gazebo. The building is used for negotiation. On the front part of the temple, Nista Mandala, you will find a yard without gazebo. When there is a ceremony, the place is used as a place for entertainment like traditional dance. If you have satisfied with the temple architecture and felt the religious atmosphere of the temple, you can continue you travel into the souvenir stores in Cakranegara Market. The shopping area is located on the west side of Meru temple. On the other side, if you want a peaceful atmosphere, you can have your relax time in Mayura Park. You just need to cross the street in front of Meru temple and you are in Mayura Park. Meru temple can be reached from Mataram easily. You can use private car, motorcycle or public transportation. If you choose public transportation, you can take public car with Ampena-Sweta route (IDR 5,000 – 10,000) or take the taxi with only IDR 25,000 from Mataram. 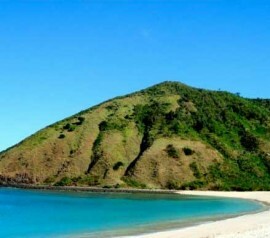 Also mentioned: meru temple, lombok temples, the biggest in lombok. Wear proper clothes when you are in the temple area. To enter the temple, you will need to wear scarf around your waist. The scarf can be borrowed for free to the temple guard. When you shop for souvenir in Cakranegara temple, make sure to bargain. Admission: Free. You can give a donation for the temple maintenance .